Decorating with old windows has become very popular especially in a shabby chic or rustic decor style. Windows are used to hold pictures, as memo boards, or used simply on their own for rustic wall decor. However, I haven’t seen a lot of seasonal decorating with old windows. That is why I am happy to show you this fun old window decor feature by Ode To Inspiration. Because the old window looked a little too new, she started by making it look more rustic and distressed. To accomplish this, the window was layered with paint and then scraped partially off. Now, most of the window is down to the bare wood with just a little bit of the various paints showing. After the window frame distressing, some fun vinyl accents were added in a Fall theme. 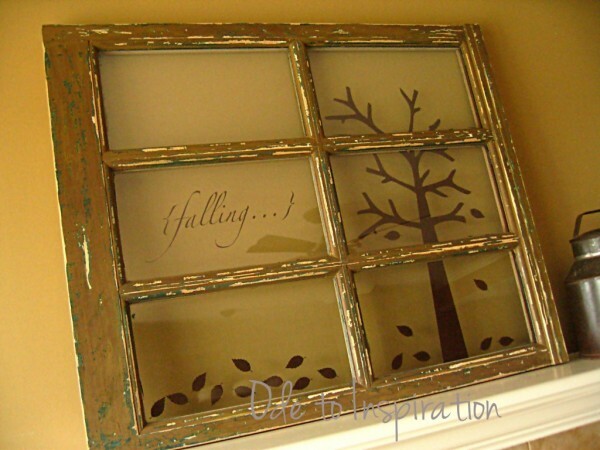 Falling leaves rustic window by Ode To Inspiration. I just love the new chippy color of the frame and “looking out” to the falling leaves. You have to see what she started out with before this transformation! Just click on the picture to get the full post. Thank you, Ode To Inspiration, for your inspiration and for sharing this at my on-going link party!